Steve Kinniburgh delivered a scathing assessment of Corby Town’s performance after their Buildbase FA Trophy hopes were ended at the hands of Yaxley at Steel Park. 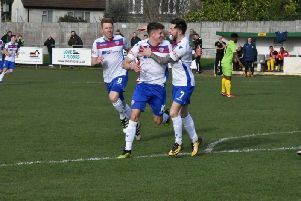 The Evo-Stik League South Division One Central rivals battled it out in the preliminary round and it was the Cuckoos who came out on top as they stunned the hosts with a 3-2 success. The Steelmen did take the lead thanks to Sam Grouse’s first goal for the club and, after falling 2-1 behind, Joel Carta brought them level from the penalty spot. However, Matthew Sparrow hit a fine winner for Yaxley and it left Kinniburgh fuming. The Corby boss made changes to his starting 11 but was in no mood to make excuses in a damning post-match interview. “We were miles away from start to finish,” said the Steelmen boss, whose team are now without a win in three games in all competitions. “We came in at half-time 1-0 up but we hadn’t been that good. We scored a good goal but the tempo was low and the reaction of the players wasn’t anywhere near where we wanted it to be. “We came out in the second half and I don’t know what happened. The players have let us down and they have let themselves down by what they gave in that second half. “The goals we lost were boys club stuff. You shouldn’t lose those goals full stop. At the level of football we are at, there are certain things that shouldn’t happen. “We are a team that is supposed to be decent and it’s the middle of October and maybe we have exploited ourselves too much. Maybe we need to get back to basics. “There are players there who have been playing since I took over a year ago and they have been magnificent but I don’t know where they were at. “It was a collective thing. The only one who could take any pride was Dean McBride, at least he tried to come out and win his headers and go up against his man. “I just don’t know what went on, it’s unacceptable and it will be addressed further in the week. “We have got a long season ahead of us and you can forgive a defeat and certain things but the performance level was well below an acceptable standard so I am not happy at all. The Steelmen are back in action next weekend when they return to their league campaign with a trip to Dunstable Town.